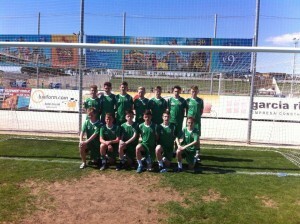 Cabinteely DDSL Premier under-14’s reached the semi-final’s of the Mare Nostrum Easter Tournament. The illustrious Mare Nostrum Cup was held over Easter and featured many elite youth football sides. The tournament, which is based in Salou, looks to test young footballers against the best Europe can offer. Staying in the Cambrils Park Resort, situated in Salou, the facilities were evidently of elite class. The hotels were equipped with rooms TV, Karaoke, restaurant, swimming pools, games room, café etc. adding to the memorable experience to be gained from competing in such a tournament. The four day tournament, which spanned from April 2-5, hosted tournaments over nine age groups, looking to cater for as many young footballers such as Cabinteely under-14’s as possible. The Irish side were said to have acquitted themselves with aplomb; showing not only class and quality on the ball on their way to reaching the semi-finals, but impeccable manners too. For more information on exploits such as that of Cabinteely under-14’s keep an eye on the blog here.